MBD is a patented aeration system designed for the optimization of aerobic bacteria in water. This technology supports beneficial aerobic bacteria growth by maintaining a large population of infused oxygen in the water, known as Micro Bubble Diffusion. The dissolved oxygen is used by the aerobic bacteria during the oxidation of the waste. More oxygen means more solid waste is naturally broken down and digested by the bacteria. The result … safe water, free from odors! The oxygen infusion process (a.k.a. 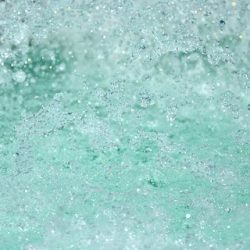 Micro Bubble Diffusion) will help bacteria break down sludge, grease, food particles and other waste, while eliminating odor and costly cleanup associated with grease traps, lagoons, septic tanks, hog confinements, and fish hatcheries. WHAT MAKES OUR PROCESS DIFFERENT & BETTER? These small, lightweight aerators have the highest oxygen transfer efficiency on the market. The 2 hp model generates about 400 pounds of oxygen per day. To generate a comparable amount of oxygen with the other types of aeration you would need a 7 hp brush, a 10hp turbine, a 13hp aspirator, a 7hp coarse bubble diffuser, or a 3.5 hp fine bubble diffuser. Low cost for comparable units makes WTR Solutions’ units appealing for all applications. There is also no other technology shown to aid aerobic digestion to the degree that micro bubble diffusion does. The bubbles are so tiny that their buoyancy is overcome by the surface tension of the water. This means that the bubbles stay resident in the water for up to 10 minutes. A concentration gradient is created, and Brownian movement allows the bubbles to become evenly dispersed in the water, top to bottom. This creates a 100% aerobic environment in the body of water. The oxygen in a large bubble is essentially wasted because they “pop” to the surface. Lots of small bubbles may contain the same amount of oxygen as one larger bubble, but surface area is greatly increased which leads to much higher oxygen transfer efficiency. Because of the long residence time of the bubble, the oxygen has ample time to be dissolved in the water. WTR Solutions’ units create the perfect environment for aerobic digestion and incorporate a microbial treatment in addition to aeration. Aerobic bacteria are much faster at digesting organic waste than anaerobic bacteria, and the process is accomplished with no odor. 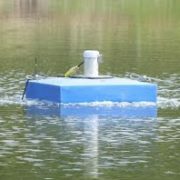 Since these aerators create a highly oxygenated environment, even at the bottom of ponds or tanks, the bacteria can effectively go to work on incoming BOD as well as existing sludge layers. Many treatment ponds have to be dredged frequently because they are essentially sludge storing receptacles. With adequate aerobic digestion this process becomes unnecessary. WTR Solutions’ units are very energy efficient. The largest motor is only 2hp, and these systems can cut operation costs by up to 70%. This low energy unit is capable of producing as much air as a 10hp turbine, and because of the small bubble size, a higher percentage of that air is usable. WTR Solutions’ units are small and lightweight. No cranes or special equipment are required to install or repair. 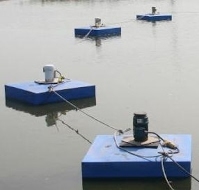 These units, with their float, weigh approximately 150 pounds. These are the shared values of all Schaus-Vorhies Companies!